One would hope that history does not repeat itself and that political advances in the cause of climate science are made over time. Since the first climate election in 2007 there have been four attempts at forming a single issue climate party, each of which in turn I have been a member. 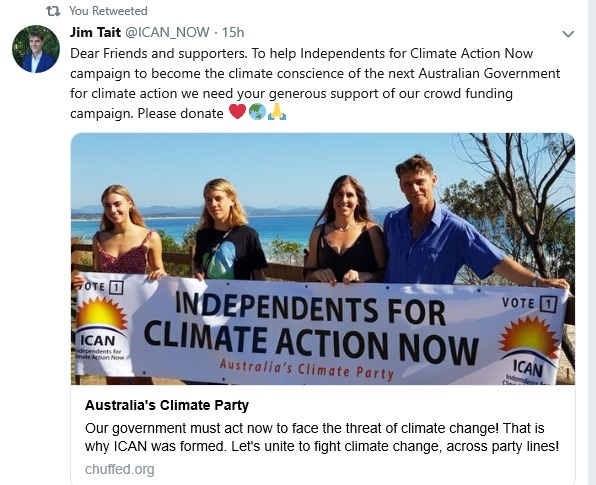 Last Thursday on the day the election was called the Independents for Climate Action Now (ICAN)* was registered by the Australian Electoral Commission. I wish ICAN well and am aware that just by being registered is a boost to climate action and a big step towards making 2019 the second climate election in Australia. In 2007 when Kevin Rudd called climate change “the greatest moral challenge of our generation” there was an ambitious single issue climate party on the hustings. As far as I am aware the Climate Change Coalition (CCC) was the first climate party in Australia and they had several high profile Senate candidates including current Sydney mayor Clover Moore and the media ‘science guru’ Dr Karl Kruszelnicki. The CCC was interestingly a party of independents grouping around what still is the greatest challenge of our generation (or any generation for that matter). In their optimistic quest for Senate seats the CCC did some shonky preference deals. They were then swamped in the ‘ruddslide’, all their candidates lost their deposits, and the organisation disappeared soon after. In 2016 the Renewable Energy Party was registered by the AEC one month before Turnbull called the election. Like the CCC the REP were overoptimistic in their chances and concentrated on the Senate. Their attempts at crowdfunding failed and they made no impression whatsoever on the mainstream media. Senate candidates are very hard to find on ballot papers the size of tablecloths and like the CCC all their candidates lost their deposits. After a year of no activity the REP was deregistered. Now ICAN is registered on the day the election is called. It would appear that they too will be concentrating on the Senate and have hopes for substantial crowdfunding – all shades of the REP. More worrying still for ICAN is that the polls indicate there is a distinct possibility of another ‘ruddslide’ and they have an enormous struggle in getting any traction in the media in such a short time – just over 5 weeks. But things are a bit different now. The science has firmed and measurements of data confirm earlier predictions – in many cases the predictions have been understatements. Global warming is starting to affect, and be noticed, by us all – especially during heatwaves, bushfires and droughts. The majority accept this and a substantial minority – especially in some conservative held city seats – consider climate change in the top three issues that concern them. Whilst ICAN will be extremely lucky to get a candidate up it is quite possible that one or more climate independents will get elected in the lower house. Even assuming the ‘ruddslide’ and a substantial ALP majority the task before us is still enormous and we can only hope that ICAN will not, like its predecessors, be a one election flop. The ALP, whilst light years ahead of the troglodytic incumbents on climate change, is still part of the ‘status quo’. Think Adani for instance. It essential that ICAN factor in worse case possibilities for the 2019 election and plan beyond that to the next one. I have no doubt that future ‘climate elections’ will follow in quick succession. And hopefully all elections from now on will be climate elections. Previous Previous post: How long has Gippsland been Warming?